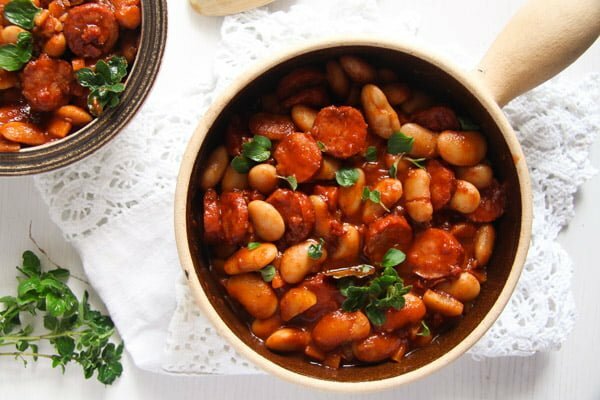 A very easy, hearty and delicious recipe for a Polish white bean and sausage stew – Fasolka po Bretonsku. 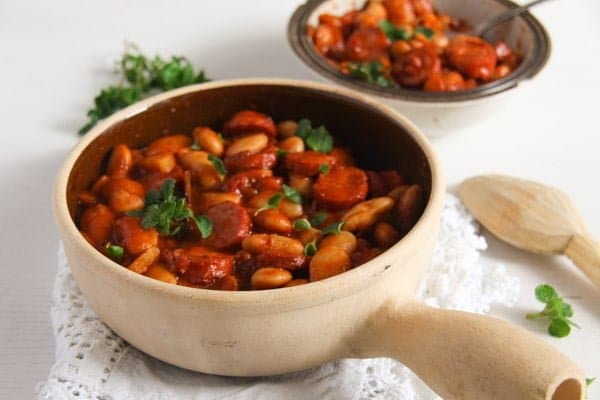 Have a look at these recipes that my grandmother used to cook all the time: the White Bean Soup with Smoked Spare Ribs and Tarragon, the Romanian White Bean Dip with Caramelized Onions – Fasole batuta or Grandma’s Perfect Bean and Vegetable Stew – Romanian Beans. 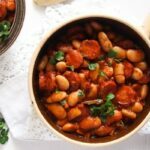 This Easy White Bean and Cabanossi Sausage Stew is a Polish recipe, something we had for dinner in the hotel where we were staying during our holiday in Poland last year. Like I have mentioned above, I totally have a thing for beans, so unlike my kids, who could not see the point of having a bean stew in a hotel, I was particularly happy about it. 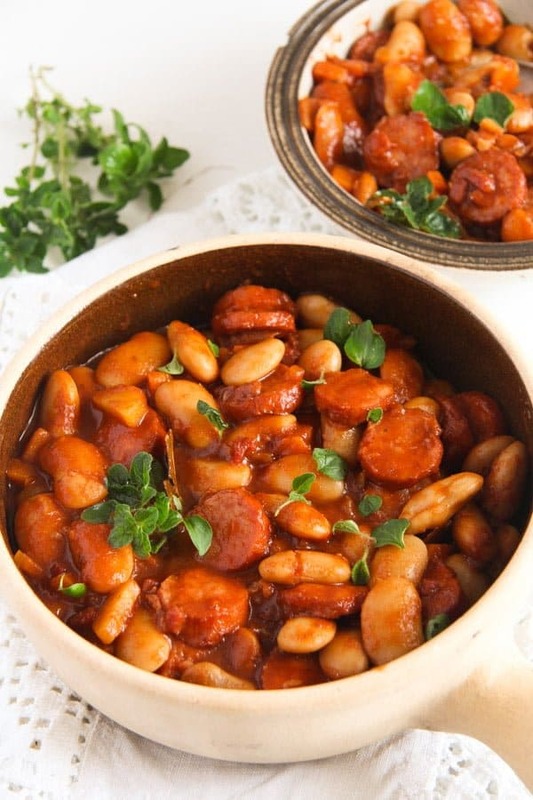 The recipe is very similar to a Romanian white bean stew recipe and maybe that was a reason for me to enjoy it even more, it reminded me of my childhood. You can use canned beans or you can cook you own beans. 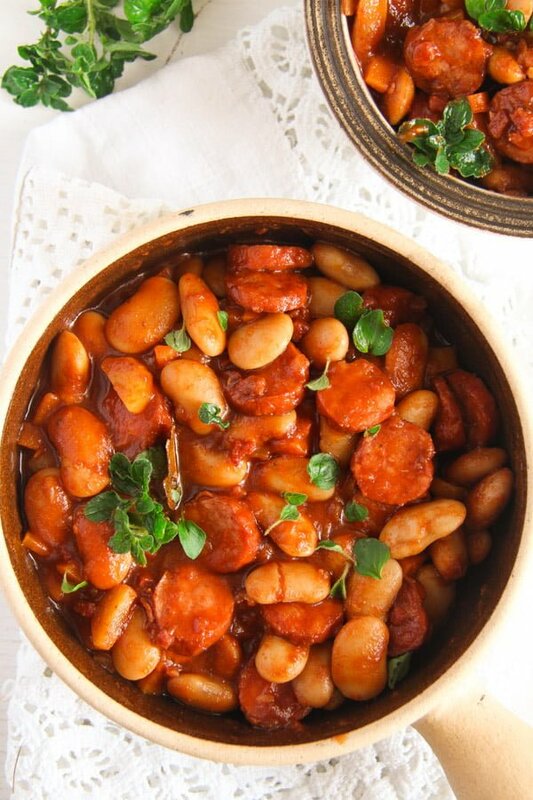 To cook your own beans, give about 200 g/ 7 oz dried beans to a large bowl. Cover with cold water and soak overnight. Drain, give to a pot, cover with plenty of water, add 1 halved onion, 2 bay leaves, some black peppercorns and some all spice corns and cook the beans until soft, at least 1 hour or more, depending on the size and age of the beans. You can replace the broth or stock used to make the stew with some of the beans' cooking liquid and in this case add a stock cube as well. Chop the onion finely. Chop the carrots into cubes or slices. Cut the ham or bacon into cubes as well. Slice the sausages. Heat the sunflower oil in a heavy bottomed pan. Cook the finely chopped onion until translucent. Add the carrots and the smoked ham or bacon and continue cooking for about 5 minutes, stirring from time to time. Add the tomato paste, stir well to coat the vegetables and sausages, then add the pureed tomatoes as well, together with the broth or stock (or beans' cooking liquid + a stock cube), bay leaves, marjoram, both paprikas, ground allspice, sugar and some salt and pepper. Bring to a boil, turn the heat down to low and simmer the stew, uncovered, for about 10 minutes. Add the cooked beans and simmer gently for another 10 minutes. Adjust the taste with salt and pepper and serve the stew with bread and gherkins or other pickled vegetables. If cooking your own beans you will need one extra onion, another 2 bay leaves, some black peppercorns and some allspice corns. 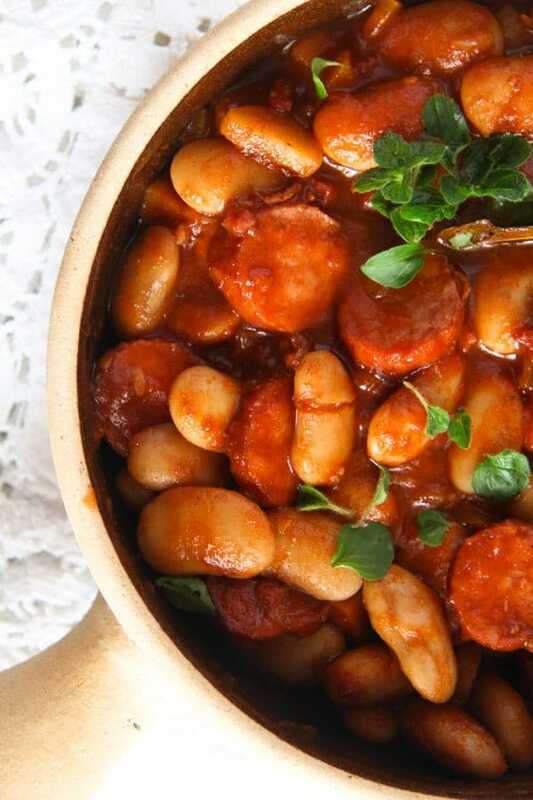 If using already cooked beans, this dish will be ready in no time. Looks delicious! I love beans of all kinds so this is right up my alley. I also love a rustic hearty dish like this that gets better with age. I wish I had a nice big pot of it! My husband and I eat a lot of bean dishes and this does sound like a very good meal. It is delicious, Karen, so hearty and comforting. You will never believe it, but I started to soak these beans this morning in order to cook fasolka po bretonsku tonight!!! It’s one of my favourite Polish dishes! Maybe also because these big beans are also my favourite among all the beans. Great, I love it too. 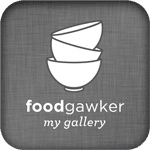 Is your recipe similar to mine? I wanted to make this delicious Polish twarog spread today, I had it every day for breakfast in Poland, but could not find the darn cheese. 🙂 I have to look somewhere else. The funny thing is that in France one can buy the equivalent of this fresh cheese but made from goat’s milk… no one has ever thought of making it from cow milk! Luckily I live close to French border and buy tons of goat cheese from a local farmer, at a Saturday market. Then I make this spread with goat cheese and it’s fantastic (it would cost a fortune in Poland, haha!). Look at that thick sauce with all those delicious ingredients. This is one of those soups you can just look at and know that it has a HUGE depth of flavors. Love it! Also, thanks for introducing me to cabanossi sausage. I’ve never had it before, so I’ll be keeping an eye out for it. Wow, Karin, so nice to hear that you like my bean soup so much, we love it too. And I think you will like this Polish dish too, it is really hearty and satisfying. And it is true, the Germans are not much into beans or pulses generally, my mother-in-law never cooks anything with pulses, the only beans I have ever had in her house are green beans with Schmand. Just the other day, I met a neighbor in the supermarket complaining she has to find black beans and yellow lentils, which are not easy to find around here. She needed that for a Landfrauen-Meeting where they talked about the health benefits of eating pulses. Her conclusion was that “Who on Earth eats pulses anyway, I would rather stick to what I know!” Only Kopfschütteln!! !